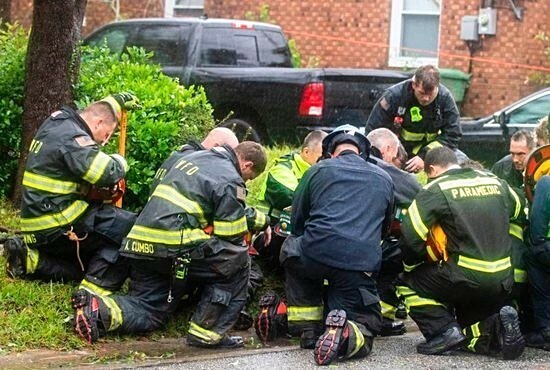 The firefighters above kneel and pray after being unable to rescue a mother and daughter when a tree fell on their home in Wilmington, NC. There are still days of flooding rain ahead for much of the Carolinas. Please join us in kneeling and praying for all in the path. As most know, CitiIMPACT is based in the Charlotte, NC area. The worst is not yet here, but we too are expecting record rainfall, trees down, and probable power outages. The flooding across NC is and will continue to be devastating. We have identified partner sites in the following cities equipped with volunteers for distribution and case management. The scope of Florence requires response over hundreds of miles. We depend on you to get the trucks on the road. The need for food, paper products, hygiene items, water, and cleaning supplies is massive. CitiIMPACT multiplies your donated dollars. A semi contains roughly $150,000 worth of supplies and costs us an average of $10,000 including shipping. Partner with us to get relief to those that need it. The many calls, texts, and emails offering to give and go are amazing. Especially touching are those who have been on the receiving end of help in previous disasters and now want to “Pay it Forward”. Individuals who have lost homes and even loved ones, now want to offer a hand to those that are experiencing their own lowest low of life to let them know that there is always Hope. Lynn from Waveland, MS rode out Katrina clinging to her rooftop texted, “It gives me chills to know what they are going through. I will be there if I can do anything”. Those stilll recovering from Harvey in Beaumont, TX are willing to pause their own rebuild to help here in NC. To these, we say, “Thank-you”. In a cultural climate full of so much division and distrust, we see you Bridging Hope!